Go hunting for jackpot riches in the land of the ancients in Age of the Gods Ruler of the Sky. Another video slot from Playtech’s hugely popular myth and legend-themed series has 5 reels and 40 paylines. It comes with stacked wilds, free spins and of course the all-important progressive jackpot prizes. Play on your desktop, tablet or mobile from between 40p and £2,000 per spin. The sounds and visuals in Age of the Gods Ruler of the Sky are just what we’ve come to expect from an Age of the Gods video slot. The imagery is simple but rather well done. With a snow-capped mountain vista in the background, the regal-looking purple reels include lower value A to 10 values as well as a selection of ancient objects. They include vases, warrior helmets and harps which offer awards of up to 250 coins per payline. Next comes the marble, Parthenon-style building which pays 30, 100 or 400 coins if you land 3, 4 or 5 in combination. Dominating the reels though is the mighty flying horse Pegasus which is the wild – it spins in full stacks and replaces all other symbols apart from the scatter. The wild is a lucrative proposition in its own right too, offering awards of 25 times your bet if you land 5 on a line. The scatter spins on reels 2, 3 and 4 only. Land it on all 3 middle reels on the same spin and you’ll trigger the Mighty Pegasus Free Games feature. After receiving a payout of 3 times your bet, you’ll be awarded 5 free spins. Once again, the stacked wilds are central to the action with even more of them appearing during the feature than in the base game. Hope to see the scatters too as they will re-trigger another round of free spins if you land 3 of them – there are no limits either. As part of the Age of the Gods series, Age of the Gods Ruler of the Sky also offers a chance to win one of 4 progressive jackpot prizes. The round can hit at random on any spin – once triggered, you’ll be taken to a new screen and offered a 5×4 grid of coins. Keep picking the coins until you reveal 3 that are matching. That’s then the prize you’ll win. The 1 you’ll be hoping to see is the Ultimate Power prize which awards the potentially life-transforming payouts. Some of the other video slots in this series have been relatively complex affairs on the features front – like Age of the Gods and Age of the Gods Furious 4. Playtech has kept things stripped back here and it works very well. The stacked wilds deliver plenty of action especially in the feature. 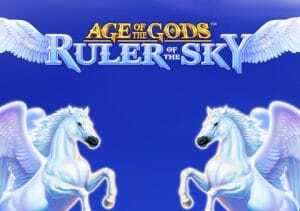 Combine the impressive design with the solid features and Age of the Gods Ruler of the Sky becomes a very playable addition in the Age of the Gods series.